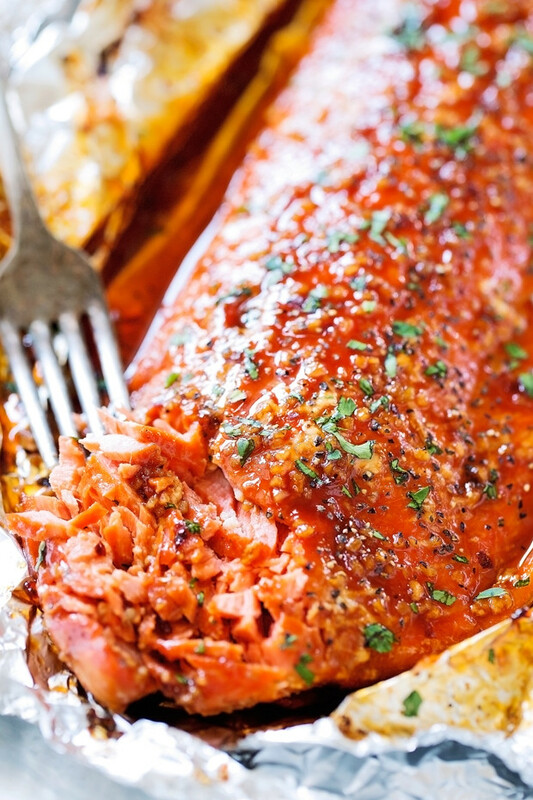 The best way to eat baked salmon in foil — glazed with Firecracker sauce! This recipe is so easy to make and pulls together in less than 30 minutes. 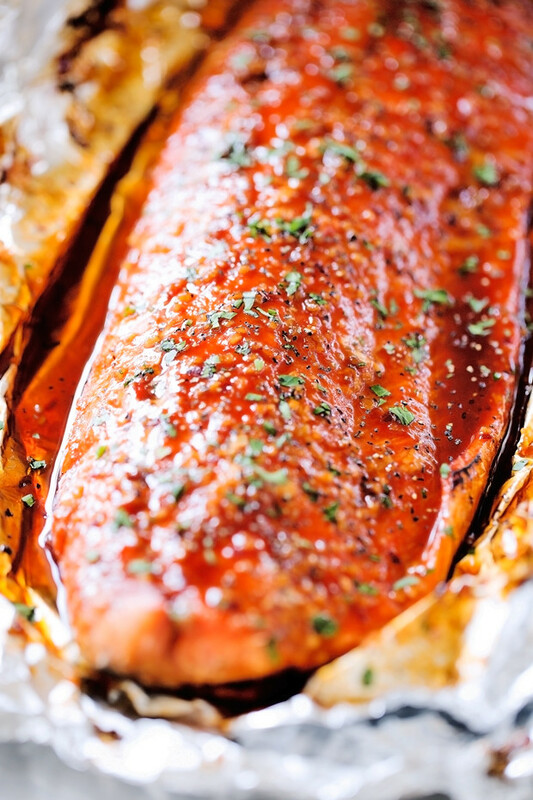 Salmon is always so flakey and tender when you bake it in foil! 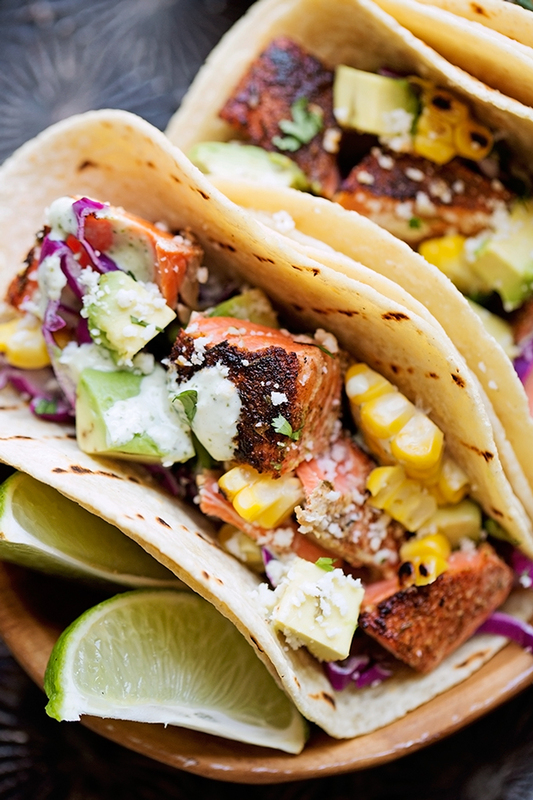 What better way to start the week than with the most delicious salmon recipe in the world. Yes friends. 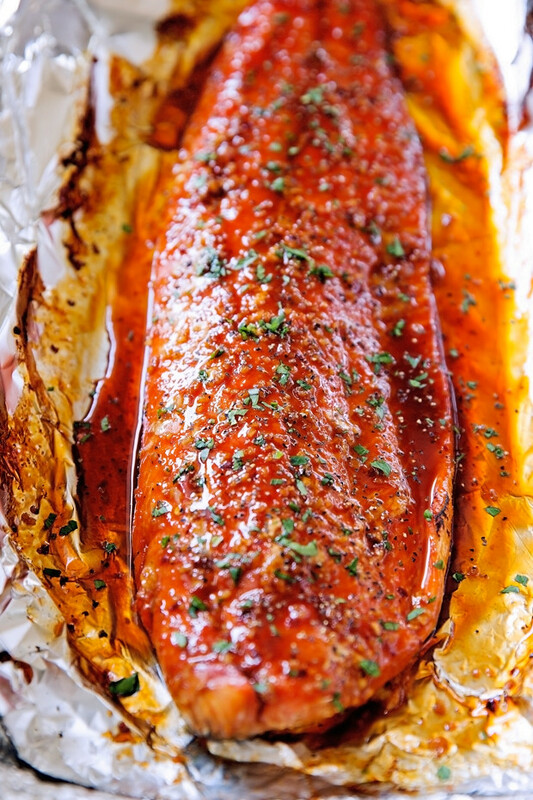 I am beyond obsessed with this salmon in foil recipe that is drizzled with my homemade firecracker sauce. I’ve been putting this sauce on everything  lately. When a simple idea like a sweet and tangy yet slightly spicy and addicting firecracker sauce gets stuck in my head on an endless loop, I find new ways to put it on everything. As always, i’m going to urge you (more like borderline harass you) to start off with good quality salmon. Say it with me friends. WILD-CAUGHT. WILD-CAUGHT. WILD-CAUGHT. Did you want to close your eyes and hold hands with people and chant it in a group? Nope, just me? I find that using ‘pink salmon’ will leave the fish wet and just not very good. The sauce will definitely become runny as the excess water from the fish will thin it out. It’s not the recipe, it’s the salmon. I encourage you to use Sockeye or Coho salmon for best results. 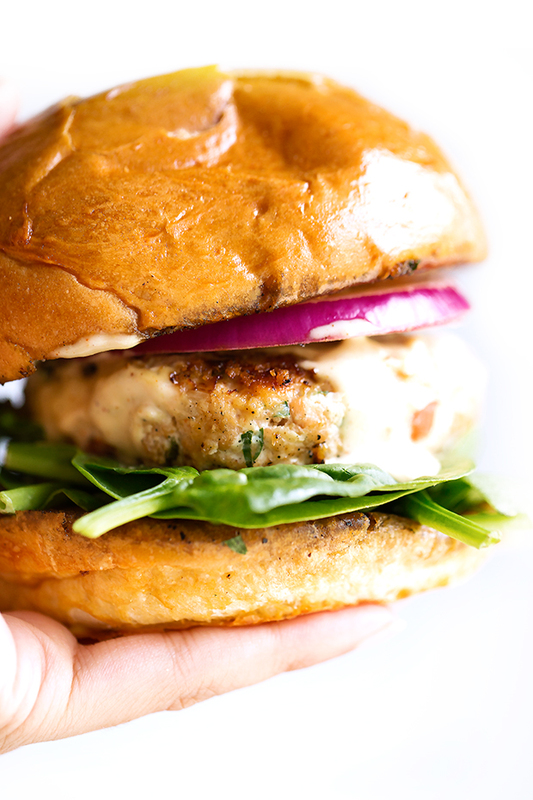 The flavor of wild-caught salmon just really takes this recipe to new levels. Okay, i’ll get off my soapbox now. ???? This recipe is super low maintenance like most of my recipes for salmon in foil. It also has just 10 basic ingredients — that’s counting the salmon and salt and pepper. It’s simple enough to pull together on a weeknight and make everyone in the family happy. Unless they don’t like fish. Can’t help you there. ???? But maybe they will once they see how delicious it can be drizzle in the most amazing sauce in the world. And please, friends, I don’t throw that title around easily. Believe me when I say this, you are going to be addicted to that sauce. Let’s talk ???? firecracker sauce???? We’re using hot sauce (I suggest something like Louisiana Hot Sauce or Franks regular hot sauce), some brown sugar, red pepper flakes, apple cider vinegar, garlic, onion powder, and a big pinch of salt. It’s simple guys. Toss it all in a sauce pan and let the sauce come to a boil then simmer for 8-10 minutes. If you’d like to serve the salmon with extra sauce, I HIGHLY encourage you to double the ingredients for the sauce. We always do. Extra sauce in a must in this house. This baked salmon recipe takes about 30 minutes from start to finish. And my most favoritest part of all is that the clean-up is a BREEZE. In fact, I suggest you volunteer to clean up when you make this recipe because it’s literally rolling the foil into a ball and taking your best aim at the waste basket. All that’s left is the saucepan full of goodness. Which will practically lick itself clean. Remember to line your baking sheet with plenty of foil, this will help make clean-up super easy. Place the fish on the foil and drizzle it with half or all of the firecracker sauce. We doubled the sauce recipe, poured half on the salmon and kept half to drizzle on veggies and such with the rest of dinner. 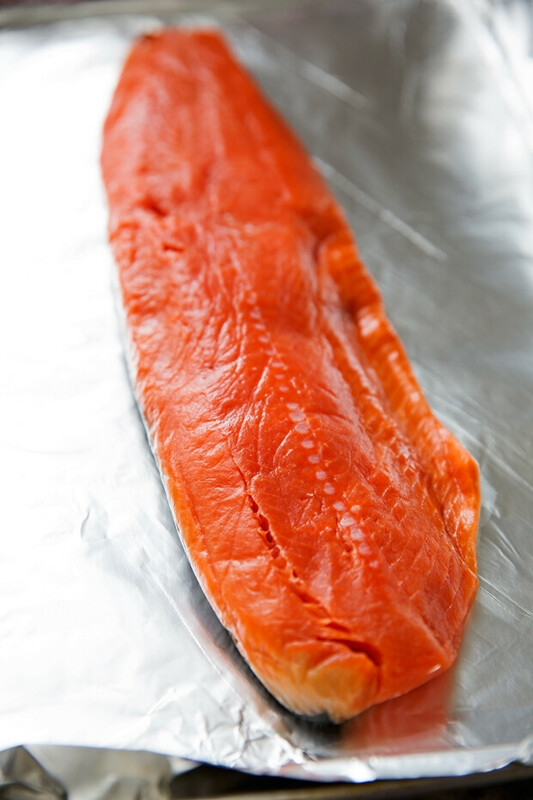 Pack the foil up tight so the salmon can steam and cook up nicely. Into the oven it goes, the most delicious smells are about to erupt from your oven. The next 12 minutes of life are going to be tough. 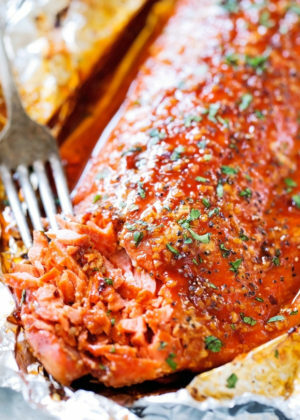 You can totally make this salmon in foil on the grill in the summer time too. Just place the foil packet on the hot grill and let it cook up for about the same amount of time give or take a couple of minutes. Just feel for firmness. Open up the foil for the last few minutes of cooking time so the color develops on top. Barbecued salmon topped with firecracker sauce is where it’s at yo. I served this baked salmon in foil super simple. Just some steamed broccoli, a salad, and a little quinoa. Obvi, I drizzled that firecracker sauce all over everything. But that’s just how I like it. In a saucepan, combine the ingredients of the firecracker sauce over medium high heat, allow to come to a boil, reduce the heat so it simmers. Let simmer for 8-10 minutes.Remove from heat and allow the sauce to cool for 3-5 minutes. The sauce will thicken as it cools so don’t worry if it looks a little thin. While the sauce is simmering, place the salmon filet in a piece of foil large enough to fold over and seal. I used multiple pieces to keep the sauce from leaking in the baking tray to make clean up easier. Place the salmon with foil on a baking tray. Season the salmon filet with salt and pepper. Using a brush or spoon, brush the salmon with the firecracker sauce. Cover with foil so that all sides are properly closed so the saucee does not leak. [b]Bake the salmon for 12-14 minutes or until the salmon is firm to the touch in the thickest portion of the fish. [/b] Open the foil and allow the fish to broil under the broiler for 2-3 minutes, keeping a close eye on it so the fish does not burn. Remove from oven, top with chopped parsley. Serve immediately. The sauce is just enough to coat the salmon before baking. If you’d like additional sauce for veggies/salad dressing etc. I’d suggest doubling the ingredients for the firecracker sauce. Cooking time may vary (allow at least an additional 2 minutes or so). The salmon can also be wrapped in foil and barbecued at 375ªF for about the same amount of time give or take a minute or two. Allow the salmon to ‘broil’ the same way you would in the oven, by opening the foil and allow the fish to dry out for just 1-2 minutes.